So I really love to bake. Really really really love it. I rarely bake out of a box. I don’t need to, and I typically enjoy the process of baking as much as the end result. However. 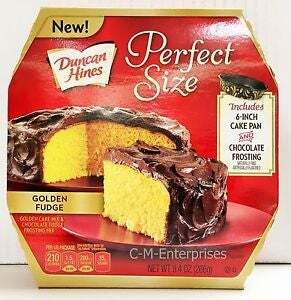 Sometimes, I really want yellow box cake with chocolate frosting. It’s comfort food, and making it from scratch just isn’t the same. So imagine my excitement when I saw this at the grocery store! It comes with a 6-inch cake pan, and enough mix baking and frosting a 6 inch cake, which is perfect for a couple of nights worth of dessert, rather than a huge, double-layer 9 inch cake that will go stale before I could possibly eat the whole thing. So last night, I excitedly mixed up a batch. But the frosting isn’t pre-made, like the kind you’d normally get in a can. It’s also a powdered mix, that you mix with butter and a little water. The cake itself also uses butter instead of oil, like I’m used to. But whatever CAKE! Except...all I can taste is butter. The cake itself is fine, but the frosting just tastes like chocolate flavored butter. I’m going to try it again tonight, but if it doesn’t start to grow on me, I think I’m going to have to throw it out. And then buy myself a regular box of cake mix as consolation. What disspointing food experiments have you participated in lately?